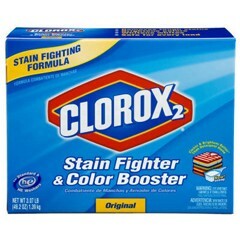 Clorox� Clorox 2� Stain Fighter & Color Booster Detergent. Detergent formulated to keep your whites whiter and your colors brighter. Fights stains and brightens colors. Leaves your clothes clean and smelling fresh.Works with both standard and high-efficiency washers.Formulated to fight stains and brighten colors. Leaves your clothes clean and smelling fresh. Compatible with both standard and high-efficiency washers. Includes four 49.2 ounce box per case.